We’re looking for motivated & proactive individuals who are communication masters and build lasting relationships with clients. If you have a naturally curious mind and want to learn and master everything there is about PPC, then Disruptive is the place for you! Located at the base of the beautiful Wasatch mountains, Disruptive Advertising is a company that gets results for their clients. With a range of digital marketing packages, we work towards creating a personalized experience for every business. Our company is driven by results, and we offer the tools and resources that you need for you and your clients’ success. Every Disruptive team member is encouraged to explore the areas they excel at, making us a company of experts rather than generalists. If you have a question, there’s someone here who has the answer. We reward our employees for their incredible work. 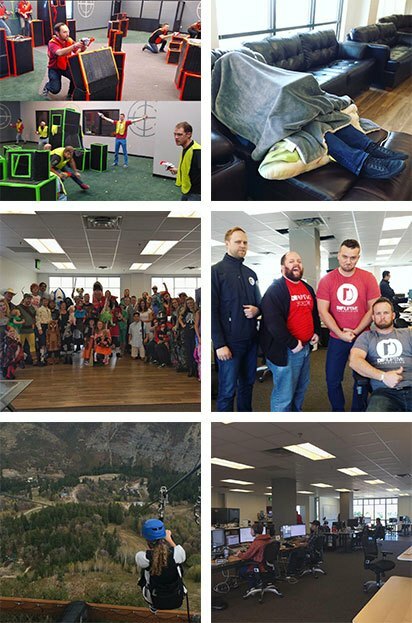 Whether it’s zip lining in Sundance, going to a movie after work, or seeing who can make the biggest Coke/Mentos explosion – we have a good time together. Our employees have a strong work ethic, and we trust them with flexibility when it comes to vacations and when/where they put in their hours. That being said, we have a culture of collaboration in our office and it’s important to us that you love coming to work every day.